Rosie O'Donnell is engaged to her girlfriend, mounted police officer and military vet Elizabeth Rooney. The two have been dating long distance for the past year, with Rooney living in Boston and O'Donnell in New York City. O'Donnell and Rooney went public with their relationship last November. On Monday, O'Donnell told People of her relationship, "It's been a long-distance thing. It's been great. I think she's a wonderful woman." The former "View" host was celebrating the 15th anniversary of her organization, Rosie's Theater Kids. O'Donnell, 56, admitted that the age gap between her and Rooney, who is 33, has been a bit awkward at times. "I keep telling her I'm too old for her. But she doesn't seem to care," she told People. "She's like, 'I was in the Army! I put my life on the line every day, you think I don't know who I want to date?' I'm like, 'Alright, I guess that's true.' She has a lot of good points." 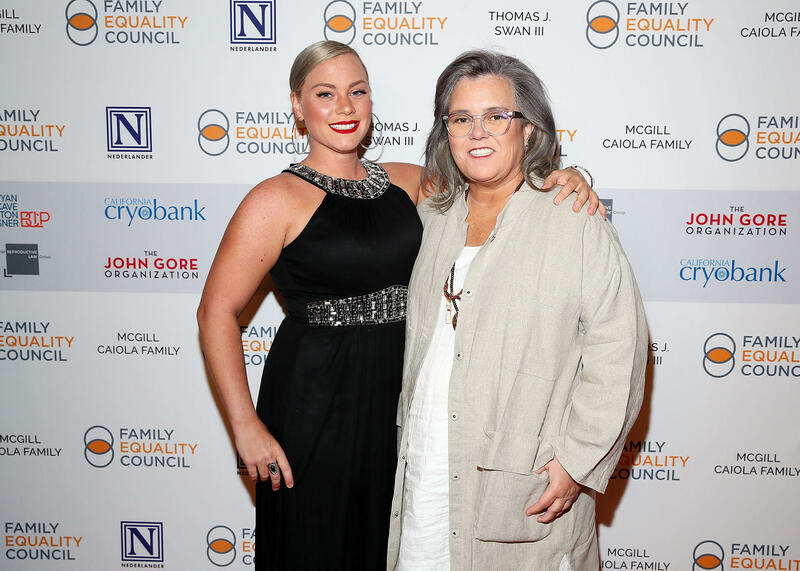 O'Donnell revealed that people frequently confuse Rooney with her 21-year-old daughter, Chelsea. "A lot of people say, 'Oh my god, Chelsea looks so great.' I'm like, 'That's not Chelsea.' That's my soon-to-be spouse," she said. "It's a little tricky. In the airport people say, 'Rosie, can I have a picture of you and your daughter?' She doesn't seem to think it's an issue at all. Nobody ever does, but I do sometimes. I was already on 'Star Search' by the time you were born." In spite of the age gap, O'Donnell said that Rooney is "very much an equal" and a "pretty unbelievable young woman." The two have not yet set a date for their wedding. O'Donnell explained, "This is a long time in the future. We both decided that that would be best." Rooney showed off a photo of her new bling on Instagram with the caption, "Y E S."
O'Donnell was married twice before. She shares four children with ex-wife Kelli Carpenter-O'Donnell, to whom she was married from 2004 to 2007. O'Donnell married Michelle Rounds in 2012, with whom she shared a daughter, but they divorced in 2015 and Rounds died of apparent suicide last September.